So far so good. But then I asked the question – which of the following three parallel potential explanations is the dominant one: 1. Easier spread of word of mouth due to internet penetration. 2. Marketing teams deliberately pressuring audiences into watching a movie upon its release. 3. The increased prevalence of “event releases” for existing established brands. 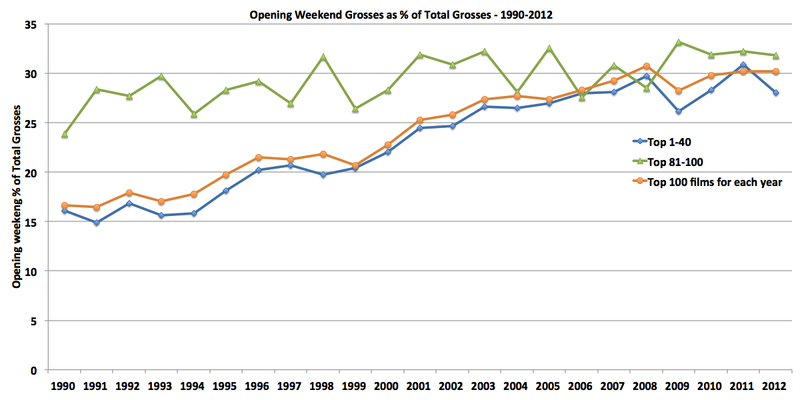 This figure shows that the less successful movies (ranked 81-100 for each year – the green line) have not been affected by the general box office trend of shifting towards the opening weekend. Their second week drop has remained in the 25%-30% range for the past two decades (compared to the huge increase in Top 100 second week drop off – from 16% to over 30%). My conclusion from this is that with all due respect to the romantic perception that the freedom of information that the internet represents is there to help the customer – is wrong in this case. According do Figure 2, reasons 2 and 3 seem to be more dominant: if we assume that the less successful films typically have a smaller budget, and more specifically a smaller marketing budget, this would mean that these budgets are responsible for the trend. Since the trend is so much stronger for movies with higher marketing budgets, the conclusion is that marketing teams are responsible for herding us to sparkling premiers. Once we realize the movie’s true quality, it’s too late. If reason 1 (easier word-of-mouth) were the winner, that would mean that we are hypothesizing that the less successful movies made less money because they were simply not as good. A previous post on this blog, shows that this relationship is a very weak one, but let’s play along: in that scenario, we would expect the effect of easier word of mouth to make these movies crash even faster as internet penetration rates rise over the years, but this is not the case. Therefore – kudos to marketing teams for using the internet well. However, we are still in the early days of this trend. The question is – will an increasing number of people just wait for the second week, like I do, in order to hear what the general reviews are on the web, before they spend money on it? That could reverse the trend. And if that happens, the studios’ response will most likely be to bombard us with even more fan-based franchises, where the first viewers get fame and glory in their fan-communities. Of course, another option would be to just make really good movies that will benefit from positive word-of-mouth, but at present – that still costs more than getting fanboys to stand in line in the cold for a special midnight premier. Agreed. Just make better movies! « 5. 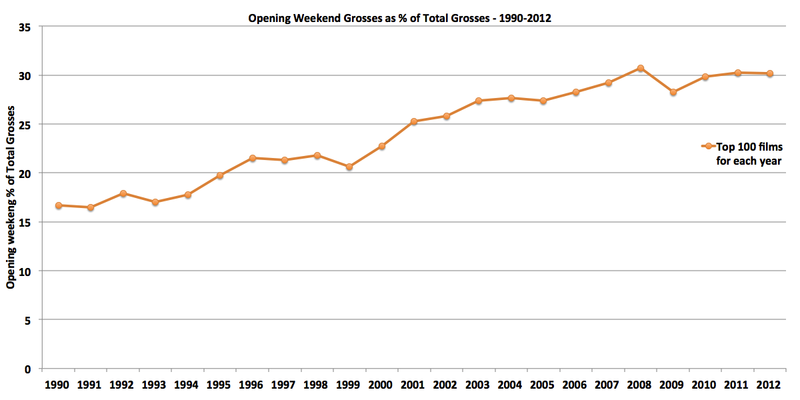 THE BASICS 1: SO WHAT’S UP WITH TOTAL INDUSTRY BOX OFFICE?